Back in my university days, my friends and I will sometimes chill out by going for drinks, dinners, and even karaoke. And now that we have graduated, we would still occasionally meet up to catch up with one another, in spite of our busy schedule. It’s important to maintain contacts once in a while so as to strengthen our friendships, good enough to last a lifetime, although we unanimously decided to not remember Miss Act-cute anymore since she’s only begging for attention and is not really interested in being any guy’s friend. And since I like to sing karaoke, I once suggested that my friends and I meet up for a karaoke session. Usually at this point, my friends would balk at my suggestion and will try to throw some cheaper ideas to spend time. But in this case, Mr. Cloud recommended that we visit “Teo Heng KTV”. And I was rather curious, as “Teo Heng” was a supplier of KTV equipment, and I was unaware that “Teo Heng” also went into the karaoke business. Mr. Cloud mentioned that being its own supplier of singing and music equipment, “Teo Heng KTV” charges one of the cheapest KTV rates as compared to KBox, or Party World. However, I was wary, for “Teo Heng KTV” is located at Katong Shopping Centre. 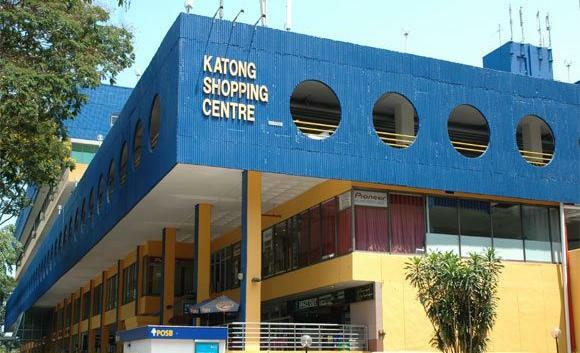 Built in the 1970’s, Katong Shopping Centre is a place that had long past its heyday and is nowadays more renowned as a rather seedy place with its main tenants consisting of massage parlours, maid agencies, matchmakers for Vietnamese brides, LAN gaming, and even VCD shops that only open on weekends (though I’ll admit those VCD shops had been gone for years). I was rather apprehensive about going there. It was decided, Mr. Cloud agreed to arrange a reservation at “Teo Heng KTV” on one Saturday. Unfortunately (or fortunately), the KTV was fully booked, and instead we had dinner somewhere else. And I pointed out the obvious to Mr. Cloud: Since “Teo Heng KTV” has supposedly the cheapest rates in town, there was no point in trying to book a reservation there since IT WILL ALWAYS BE FULLY BOOKED as everybody will want to go there. With that I told Mr. Cloud we should not to consider going there anymore, but instead opt for the more popular KTVs which we are familar with. Nonetheless, I would like to commend Mr. Cloud for playing his part in giving ideas for us friends to hang out, even though all of us have had to put up with his antics of teasing or mocking every last word or syllable or topic of discussion mentioned by anyone, regardless of whether or not it is offensive. Sometimes his favourite habit seems to be making fun of his friends’ Facebook profile pictures, especially if it’s a “guai-lan” face. Likewise, Mr. No-Aim deserves worthy mention for being friend enough to show up whenever he can, although sometimes Mr. No-Aim sure knows how to dampen the atmosphere, such as once, when we had almost decided on eating at a German restaurant, where there is good food, only to change location at the last moment when Mr. No-Aim found that the place was al fresco dining, there is no air-con and there’s some smoke from people smoking outside. He never seem to realize that the best and most meaningful things in life are those in which you had to put in your effort and overcome obstacles in order to achieve. All his life Mr. No-Aim spends his full-time travelling from one path to another so as to avoid any little bit of inconvenience he may encounter, living a life with with no particular motivation to pursue any goals or aims. And to skip any possible embarrassment Mr. No-Aim vetoes nearly every KTV suggestion that I made. Who knows, maybe if he went to karaoke more often he may learn to enjoy it. I could have sworn he had no problems singing a Jay Chou rap. Which now brings us to Mr. H, who had been considerably missing in the entire story. And that is precisely the point. Mr. H has taken to totally ignoring all calls and logging off from WhatsApp whenever Mr. Cloud and I try to contact him. It’s as if he rationalizes that there’s no reason for us to find him so he wouldn’t answer, even if it’s an invitation to hang out. As a result it is impossible for us to confirm whether the photo on his Facebook album of the babe with a large tattoo on her shoulder is that of his girlfriend. We can’t even ask him about it, let alone find out what’s going on in his life, especially now that Mr. H had (allegedly by accident) deleted his Facebook account, in which he had previously posted updates and pictures of his travels. I’ll be frank. I will understand if you feel that it is none of our business to pry into your private life, but if you are going to totally avoid your friends just so as to prevent any of us from having a chance to tease you about your current love, isn’t that taking things way to the extreme? Any comments if we should make will only be in jest with no malice intended, and what makes you think that I will actually do that? It’s not even in my nature to mock and make fun of others anyway (Ok, perhaps Mr. Cloud will do that, but that’s not my problem). It is a bit hard for us to share in your happiness if we are seriously unaware about it. You keep us all in the dark, I hope you are happy.